40 n Performance & Hotrod Business n May 2015 PERFORMANCE Paulsen and Johnny Rutherford in 1987. (Photo by Dennis Torres) Paulsen competes in Terre Haute in a USAC Sprint Car in 1985. (Photo by Tracy Talley) Paulsen changing the right front tire as chief mechanic for Johnny Rutherford at the 1986 Indy 500. (Photo by Dennis Torres) At the 1989 Indy 500. (Photo by Dennis Torres) (Left) At Indianapolis in 1996 with driver Billy Boat. (Above) Paulsen was recognized for com- peting in the 40th anniversary running of the SCORE Baja 1000. PHB: What's the best thing about your job? CP: As most people who love what they do will say, I really don't have a job; I do what I love. I've been very fortunate to have a great business. A big part of our business is the group of employees we have. Most of our staff have an extensive background in racing and the aftermarket. They are the back- bone of C&R. C&R has dominated in most everything we've done and it's been very satisfying. PHB: What's the biggest challenge? CP: Our biggest challenge in the after- market is getting the message out about our racing heritage and that we are the same company building race-winning radiators for every major team on Sunday and the same company building very high- quality radiators for the HPA. We now have to market ourselves, which we really didn't do in racing. PHB: How do you see the current state of the performance aftermarket? CP: We are new to this market, but learning more every day. I'm amazed at how huge this market really is. What I see is a very healthy and grow- ing market. I feel a lot of this is due to the great job SEMA does for every facet of the aftermarket. 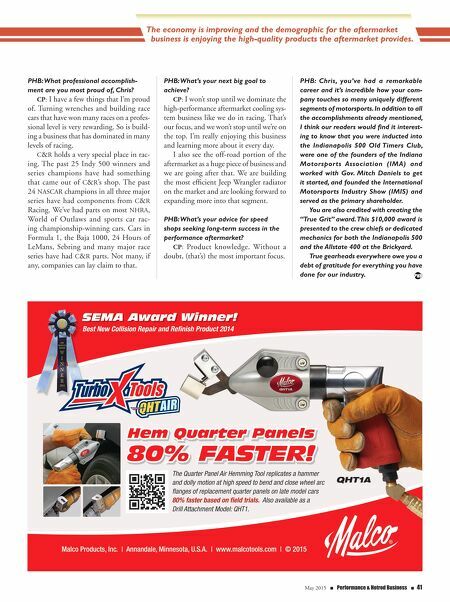 SEMA has already done very good things for our company and that membership is priceless. We use the services of R&R Marketing and they are really doing a great job of helping us build our brand in the aftermar- ket. C&R's sales are growing very rapidly in HPA, to the tune of 40 percent per year. PHB: Where do you think the industry will be in 10 years? CP: I certainly see great things in the future. I look at the strength of SEMA and how proactive they are in terms of build- ing, promoting and working for the after- market. I don't see anything to stop the growth. The economy is improving and the demographic for the aftermarket business is enjoying the high-quality products the aftermarket provides.